Previous PostA Copyrighting Journey in Two Parts (Plus Cats)Next PostWhen is spoken word a remix? Caitlin– Those 2 1/2 minutes are going to give me nightmares. More to your point, these YouTube remixes seem like really murky waters to me. On the one hand, they are original creations/amalgamations that have their own artistic value. But on the other hand, I can’t help but think there is the potential for the creator to profit from the work of (uncompensated others). I guess I’m just conflicted because I can completely understand why those artists (or, more likely, those production companies) would want that material removed, but I also enjoy watching the semi-original creations of others (at least I do when they don’t involve so much blood). I see your point here. I think I would have two responses. The first is that I tend not to be super sympathetic if NBC were to come after these videos and claim to be an uncompensated victim. The show generates a lot of viewers, who nearly rabidly (in the case of this fandom) promote the show through watching and merchandise purchasing, and also promote the show through such fanvids. I don’t think NBC has a case to say that they are somehow losing money because of these creations…or that the user makes money off of the original creator’s work. You’re absolutely right that this particular video has a lot of views. I didn’t pay attention to that when choosing it, but I can say that it is not common. Normally, a fanvid will have somewhere between 3 and 5k views. This particular vidder has been creating fanvids for I think maybe 8 years now. And across multiple fandoms – so she has built up a reputation, but not in the youtube famous range. My second response comes into play here. I don’t know that it’s a problem if a user builds a reputation in this near-apprenticeship mode (to use Lessig’s terms) and directs others toward their original creations. I feel like that is a common process across mediums. We wouldn’t question, for example, an article author who critiques, let’s say Lessig, and who has under her name a link to her own blog/papers/book or whatnot. That doesn’t mean she diminishes the original work just because she uses one type of work that she does to promote another. At least for Hannibal, the show’s exec. producer Bryan Fuller actively encourages fan creations. NBC Hannibal’s official tumblr prior to this season even went so far as to ask users to create fanart that would be used as official promotional material. What I tend to be more worried about is production companies swallowing user-created content, encouraging but exploiting remixers while maintaining a friendly “we love how you remix – look at how advanced we are” attitude. The more I write about it, the more complicated the questions become! To begin with, the first Hannibal video was absolutely beautifully done–thanks for sharing!–and something I could have easily believed was an official promo for Season 2. It certainly muddies the either-or “amateur”/”professional” (and RW/RO) dichotomy (28-29) others have questioned Lessig on. As Heather observed, this video does indeed condense some of the scariest/grossest bits of the show (and was pretty much a mini-movie for “Swiggity-Swag the Nightmare Stag”: http://www.tumblr.com/tagged/swiggity-swag-the-nightmare-stag), but it also gives an excellent overview of the important dynamics of the first season. Essentially, it is a clever multimedia summary which highlights certain elements while cutting others for effect. Even the song chosen for this video fits excellently–even if you happen to recognize it (as I did) as Tom ODell’s “Another Love” (http://www.youtube.com/watch?v=MwpMEbgC7DA) and realize the video is seamlessly using only parts of the original song to not only suit the theme of the former but give an alternative meaning to the latter. I agree – I didn’t talk here about it, but the manipulation and changed meaning is a two-way street for video/audio. Crack vids, I think, can point that out especially. There is one Hannibal crack vid in which the vidder uses Christian Bale’s rant about the person walking around on set during filming and sets it over the Nightmare stag – “I don’t need to start walking; he needs to stop walking!” Never in a million years would I put those two together, but there’s such a fascinating parallel created. I’ve been intrigued by the negative responses that Lessig has garnered so far, because while I agree that he tends toward hyperbole, I also feel that hyperbole responds to a kind of copyright fanaticism that the crack videos illustrate and work against. 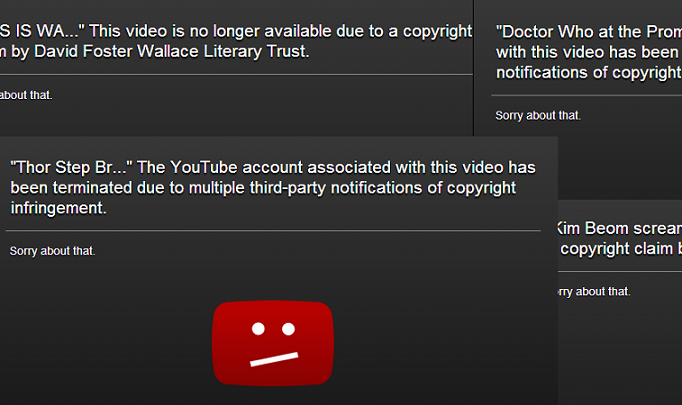 I’m also intrigued that your screenshot suggests that the David Foster Wallace Literary Trust is spending time tracking down YouTube copyright violators. What’s up with that? You know, I couldn’t exactly tell you about that video – I don’t remember it concretely. I think it might have had something to do with a filmed version of an essay that was particularly popular – but I’m not certain. Technical question: can everyone see my comment to this blog entry (from 3/19 at 10:39pm)? WordPress informs me that my comment is “awaiting moderation,” but I’m not sure why–Caitlin or Joe, do you need to approve it before it can be officially posted? Has anyone else run across this issue?